Now Swansea-based producer Karen Struel-White is planning a musical about the astonishing life of ‘Exotic’ Adrian Street. He was born in Brynmawr and went to work in the local coal pit alongside his father, who had worked underground for decades, but the life of a miner was not for him and at 16 he left Wales to follow his dream of becoming a world wrestling champion. Despite being small in stature and mocked by many he beat the odds to achieve his goal and became famous in both the UK and also the USA where he now lives, aged 73, in Gulf Breeze, Florida. 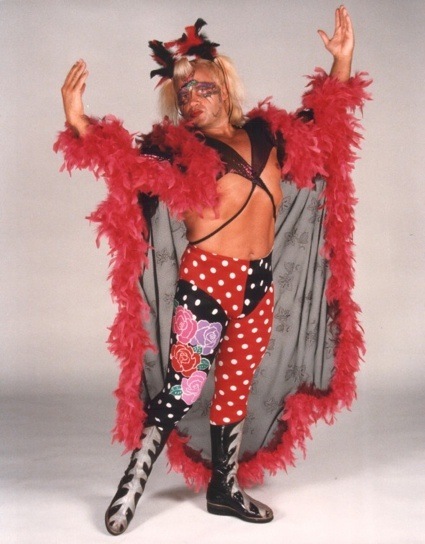 Street developed his signature flamboyant and effeminate dress sense to get noticed in the “grunts, grapples and grannies” era of televised professional British wrestling in the 1960s and ’70s and used make-up and glitter with the wrestler’s long shaggy hair dyed platinum blond and teased into cutesy schoolgirl pigtails. Now known as ‘Exotic’ Adrian Street, his favourite moves in the ring included kissing opponents to escape being pinned down and putting make up on them when they were trapped. His story is now being brought to the stage in a musical by Ms Struel-White who previously brought her own ‘WAG’ past – she dated highly-paid footballers when her father Malcolm Struel was chairman of Swansea City – onto the West End stage in WAG The Musical. Next March she launches her Marilyn Monroe show – Norma Jeane The Musical. Adrian Street, speaking from Florida, added: “I’m repeatedly hearing from many people around the world my life story is so inspiring and my ability in overcoming obstacles to realise my ambitions has helped them make the most of their own potential. Having moved, alone, to London Street he said he “slogged around for a while” before creating an image for himself at a time when wrestlers like Big Daddy were becoming huge stars on British TV. In 1969 Street met his future manager and wife Linda Gunthorpe Hawker and the two formed a double-act, with ‘Miss Linda’ becoming one of professional wrestling’s first female valets. Street’s ring persona was an accident. A fan of US wrestler ‘Nature Boy’ Buddy Rogers, the Welshman copied his blond, bronzed Adonis look. We thank Adrian Street, Karen Struel White and of course Robin Turner from the Western Mail for this article and will of course continue to bring you more updates on what is promising to be a great production as and when we receive them.